A hero mum's appeal for safety measures at a notoriously treacherous Welsh beauty spot have been rejected. Blue Pool at Broughton Bay, Gower, has been branded "dangerous" by the RNLI because of its deep water, strong currents and heavy surf. Ceri Saunders, who saved a nine-year-old boy from drowning at the spot, is campaigning for new safety measures. But Robert Elson, of landowners Broughton Farm Caravan Park, said "common sense" was needed - not signs. The natural lagoon next to the golden sands of Broughton Bay is among the most picturesque sites on Gower attracting thousands of visitors every year. But its steep jagged cliffs and changeable sea conditions saw the RNLI attend five incidents there in 2018 alone. Among those calls, last August, was when Mrs Saunders and her son Aaron, from Swansea, jumped into the sea to save a boy from drowning. Mrs Saunders suffered hypothermia during the rescue that she described as "every mother's nightmare" and they were both nominated for a St David Award for bravery. "If anything comes out of this, it's that nobody else risks their lives. Signage and awareness are vitally important," she said. "It's a very beautiful spot but deceiving. Clearly it's not safe and we desperately need signs." But the stumbling block to any signage is who will pay. Swansea council said they cannot act because the land leading to the cliff is privately owned by Broughton Farm Caravan Park. And the owners of the park believe putting up signs would be a waste of time and spoil the natural beauty of the site. Mr Elson said: "The reality is that the sea is dangerous and sadly some people are unable or unwilling to understand the consequences of their actions. "Thank goodness (Mrs Saunders) was a strong swimmer, knew the sea and was willing to save that boy, so we didn't have a fatality. "But if I put up a sign, would anyone actually read it? "I would just be spending money and spoiling a beautiful spot unnecessarily. "If someone wants to pay, then fine. But if you put a sign here, then you would have to do the same the entire length of the Wales national coastal path." Councillor Richard Lewis said he has pressed the issue with Swansea council's tourism department. However he agreed that visitors must take "greater responsibility" before entering the sea. "It's difficult because Gower is the bread basket of Swansea, bringing in millions of visitors and pounds every year. So we need to make sure those people are safe," he said. "But even on beaches where we've worked to have lifeguards on duty, people still ignore their advice." The RNLI urges people to check the weather and tides before setting off to the coast. 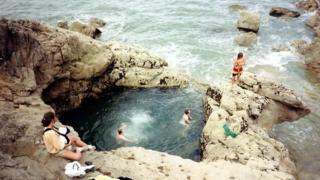 It has also warned against cold-water shock in deep plunge pools such as Blue Pool. A spokesperson said: "People visiting the coast are always advised to visit a lifeguarded beach where possible."